John Paul Stevens, Sandra Day O’Connor, Antonin Scalia, William H. Rehnquist, William J. Brennan, Jr., Thurgood Marshall, Byron R. White, Lewis F. Powell, Jr., and Harry A. Blackmun. 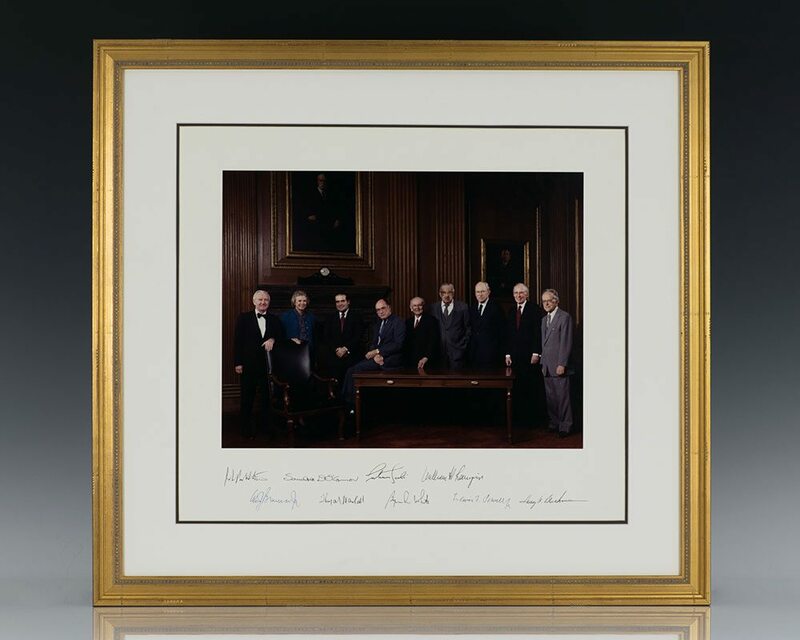 William Rehnquist Supreme Court oversized photograph signed by all nine justices. Group portrait taken on the occasion of the investiture of William Rehnquist being elevated to Chief Justice, and Antonin Scalia’s investiture. Signed by John Paul Stevens, Sandra Day O’Connor, Antonin Scalia, William H. Rehnquist, William J. Brennan, Jr., Thurgood Marshall, Byron R. White, Lewis F. Powell, Jr., and Harry A. Blackmun. The photograph, 13 inches by 10 inches. Matted and framed to an overall size of 21 inches by 23 inches. The Rehnquist Court refers to the Supreme Court of the United States from 1986 to 2005, when William Rehnquist served as Chief Justice of the United States. Rehnquist succeeded Warren Burger as Chief Justice after the latter's retirement, and Rehnquist served as Chief Justice until his death in 2005, at which point John Roberts was nominated and confirmed as Rehnquist's replacement. The Rehnquist Court is generally considered to be more conservative than the preceding Burger Court and Warren Court. According to Jeffrey Rosen, Rehnquist combined an amiable nature with great organizational skill, and he "led a Court that put the brakes on some of the excesses of the Earl Warren era while keeping pace with the sentiments of a majority of the country." Biographer John Jenkins argued that Rehnquist politicized the Supreme Court and moved the court and the country to the right. Through its rulings, the Rehnquist Court often promoted a policy of New Federalism in which more power was given to the states at the expense of the federal government. The Rehnquist Court was also notable for its stability, as the same nine justices served together from 1994 to 2005, the longest such stretch in Supreme Court history. 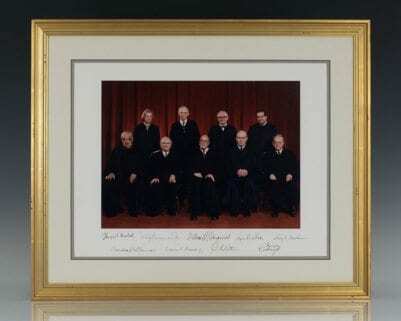 William Rehnquist Supreme Court oversized photograph signed by all nine justices, dressed in robes. Group portrait taken on the occasion of the investiture of William Rehnquist being elevated to Chief Justice, and Antonin Scalia’s investiture. Signed by John Paul Stevens, Sandra Day O’Connor, Antonin Scalia, William H. Rehnquist, William J. Brennan, Jr., Thurgood Marshall, Byron R. White, Lewis F. Powell, Jr., and Harry A. Blackmun. Matted and framed to an overall size of 21 inches by 23 inches. Boston: Houghton Mifflin Company, 1967. First edition of this Galbraith landmark work. Octavo, original brown cloth. Signed by John Kenneth Galbraith on the front free endpaper. Fine in a near fine dust jacket that shows only the lightest of wear. A very sharp example of this economic highspot.